Entering their game on Friday, No. 18 Boston College (0-3-0, 0-0-0 Hockey East) and their dynamic offense had just hung five goals on Wisconsin. 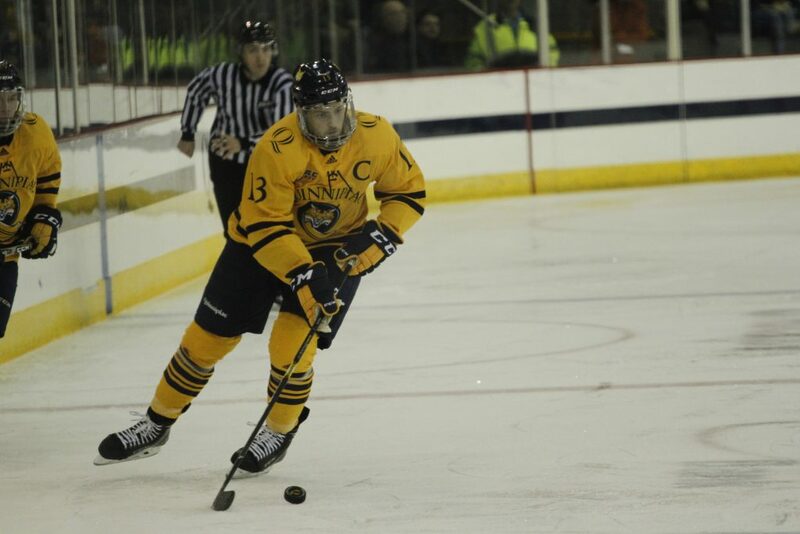 Quinnipiac (3-0-0, 0-0-0 ECAC Hockey) was one of the top scoring teams in the nation, with seven goals in two games. The two teams had firepower all throughout their forward lines. Naturally, what we saw was a defensive clinic that saw the Bobcats win, 1-0. In a head-to-head matchup that has seen Quinnipiac dominate in recent years, it was the No. 18 Boston College Eagles that came to Hamden as the favorites. Despite falling six spots in the USCHO poll after a weekend sweep at the hands of unranked Wisconsin, they still possessed a roster stacked with NHL talent – including Oliver Wahlstrom, last season’s 11th overall pick. The story of the game, however, was the one looking back at Wahlstrom for sixty minutes – Quinnipiac goaltender Keith Petruzzelli. “[It’s] maturity. It’s tough playing college hockey at eighteen years old… he’s working with our goalie coach and battling out at practice,” head coach Rand Pecknold said on his sophomore goaltender’s performance. Petruzzelli, who has started each of the first three games of the season for Quinnipiac, recorded his first career collegiate shutout, turning away all 21 shots he faced en route to the Bobcats’ first win over a ranked opponent this season. His performance tonight may have sealed his spot as the starting goaltender in a position battle against Andrew Shortridge that has been raging since the preseason of last year. “Being able to be in there every night, you’re able to find rhythm, you’re able to understand your defensemen and how they play, where they’re going to take away, and what you’ve got covered,” Petruzzelli said. Because of Petruzzelli’s performance, all the Bobcats ended up needing was one goal. That was exactly what they got. With under three minutes to play in the first period, the Bobcats were gifted a 5-on-3 opportunity after Eagles captain Michael Kim went to the box for slashing while on the penalty kill. With just a few seconds of the two-man advantage remaining, it was Chase Priskie who got the puck in the high slot and buried a slap shot into the top right for the game’s first – and only – goal. The Eagles didn’t go down without a fight, though. In fact, there were plenty of situations where a goal seemed almost inevitable until either Petruzzelli stepped in or the puck was misplayed. With around five minutes remaining in the period, a fine passing display by Boston College left senior defenseman Casey Fitzgerald with the puck at the edge of the goalie crease. Fitzgerald hit a one-timer at the net, but Petruzzelli stood tall and covered the puck. Five minutes later, the Eagles best chance of the game left them with nothing to show for it after freshman forward Marc McLaughlin missed a wide open net on a breakaway after Petruzzelli was stuck in a hoard of skaters on the left side of the crease. With six minutes left in the third, it was Wahlstrom who tried to tie the game himself. He let off a wrister from the right faceoff circle that looked certain to light the lamp, but Petruzzelli made a quick reflex save with his left leg to parry away the puck. “He looks a little more confident in net. Coming out and challenging… when he does that, he cuts off the angle and allows himself to make saves,” Priskie said about his goaltender’s performance. Despite Boston College’s chances, the Bobcats stood tall. And when the buzzer sounded after sixty minutes, the Bobcats found themselves 3-0-0 for the first time since 2015-2016. “It’s obviously how you want to start the season. We go into every game with the same mindset, and that is to win. To see our hard work paid off is just a great feeling,” Priskie said. The Bobcats will have a week to practice and prepare for AIC in a home-and-home weekend series. They travel to Springfield, Mass. for the first game on Friday, and the teams come to Hamden on Saturday. Puck drop for both games is lined up for 7 p.m.